Set in a period of popular nationalism in India, this book is centered around ‘a man out of his times’. Sir Jadunath Sarkar, a prominent Indian historian, professed history at a time when the colonial states were secretive about its own records. He, along with Rao Bahadur Govindan Sakharam Sardesai, his contemporary and confidant, discovered ways to delve into such records owing to his dispassionate objective to write history based on primary sourced evidence. 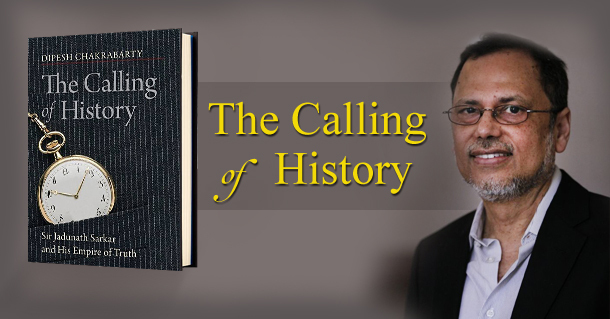 Dipesh Chakraborthy in, The Calling of History has carried out a fascinating study of the Indian Historical writing between the late nineteenth and twentieth century. In a politically charged atmosphere that Sarkar lived in, his belief in the benevolence of the British rule and his analysis of historical facts and figure rather than ‘false patriotism’, did not sit well with the surrounding. The book indulges in questioning the relevance of the past in the recent times. It throws light on how the cloistered public domains of lives interacted with each other. He also gives an insightful account on how historians in colonial India formulated the practices in the field. A valuable look at the double life of history and how the strain between the public and the private sides affects a scholar’s career.